Tiger Zinda Hai is the biggest Hindi film of the year, which releases on 22nd December. 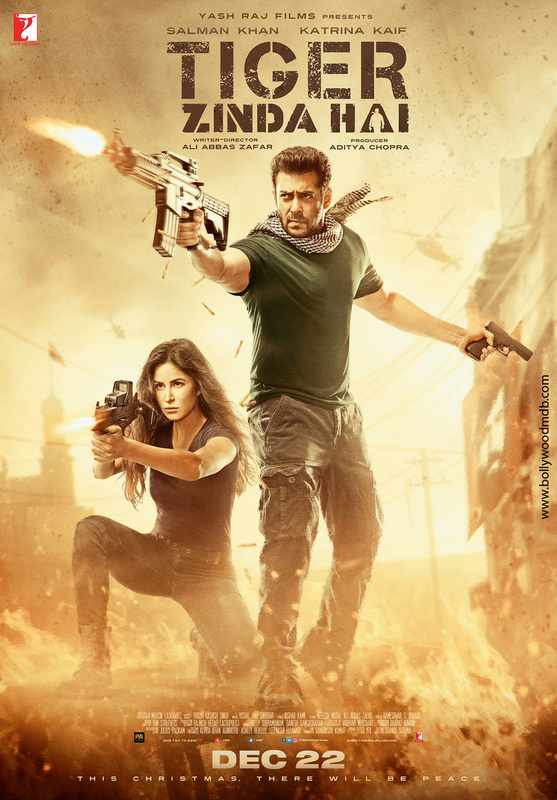 Read here Tiger Zinda Hai movie review on BollywoodMDB before booking your tickets. It has been 8 years since RAW has not contacted Tiger (Salman Khan), who is currently living a peaceful life in Austria with his wife Zoya (Katrina Kaif) and son. RAW finds out his whereabouts as they need him badly to save 25 Indian nurses from the clutches of ISC that has held them as hostages at Ikrit in Iraq. ISC is spearheaded by Abu Usman (Sajjad Delafrooz), a wanted terrorist that America has decided to kill through air strikes on the same hospital where all nurses are held as hostages. India requests America to stall air strikes for a few days so that all nurses could be rescued. Tiger decides to come onboard to save the prestige and honor of his country and builds his own team for the mission. He and his team get only 7 days to accomplish the mission before America launches air strikes on the hospital. Will he be able to save the nurses? How Zoya, an ISI agent, helps Tiger in the mission. To know, watch the film. While Ek Tha Tiger was directed by Kabir Khan, Tiger Zinda Hai is helmed by Ali Abbas Zafar, who has previously directed Salman Khan in Sultan. It is Zafar’s second film with Khan, and after watching Tiger Zinda Hai you can feel that he is one of those few directors in Bollywood who gets best out of the actor. He has made Salman do things which will take the actor’s superstardom to a new level. Not just visually, Tiger Zinda Hai is a powerful film on paper also. Along with calling the shots, Ali has co-written the story and screenplay of the film. And he scores distinction marks in both the departments. We hope he comes up with another film with Salman Khan soon. It will be great if the next film turns out to be the next installment of Tiger series. Tiger Zinda Hai is fantastic on all fronts. Camerawork by Marcin Laskawiec is amazing and so are the locations where the film has been shot. The film has been canned so beautifully that you will love every frame of it. As expected, the production value of the movie is quite rich, which makes its canvas look grand and appealing. Editing plays an important part in an actioner and the job has been done crisply by Rameshwar S. Bhagat. Action choreography is just amazing and so is background score. The film has music which does complete justice to the theme of the movie. However, not all songs which you find in the soundtrack are shown in the film. The album has a mix of everything, which is a rarity in today’s music scenario. On one hand, you have an electric song like Swag Se Swagat, which comes as credits start rolling in the end. On the other hand, there is an out-and-out romantic number Dil Diyan Gallan, which is at the beginning of the film. Both songs are compelling and can be heard repeatedly. The theme song, Zinda Hai gives you an adrenaline rush. Then there is a situational song like Daata Tu which spells its magic slowly and slowly. A Sufi rock track Tera Noor is very edgy and highly recommendable. Overall, the music of Tiger Zinda Hai is good, if not exceptional. Tiger Zinda Hai is undeniably the biggest Hindi entertainer of 2017. If you loved Ek Tha Tiger, then you are going to love its sequel even more. The film boasts of everything that you need to end your year on a high note: action, romance, and suspense. An adrenaline rush of a thriller, Tiger Zinda Hai is definitely a must watch. Neha Kakkar completes the full circle of life; returns to Indian Idol, this time as a Judge!